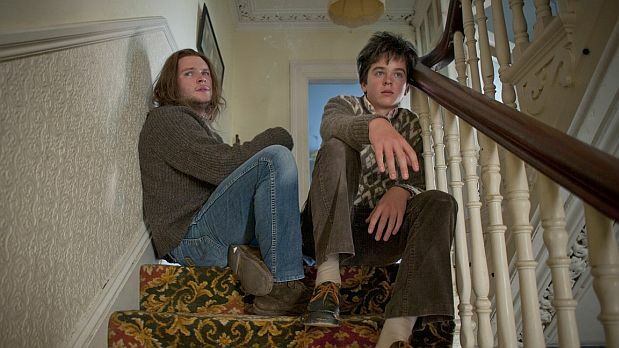 Ferdia Walsh-Peelo and Mark McKenna in Sing Street. 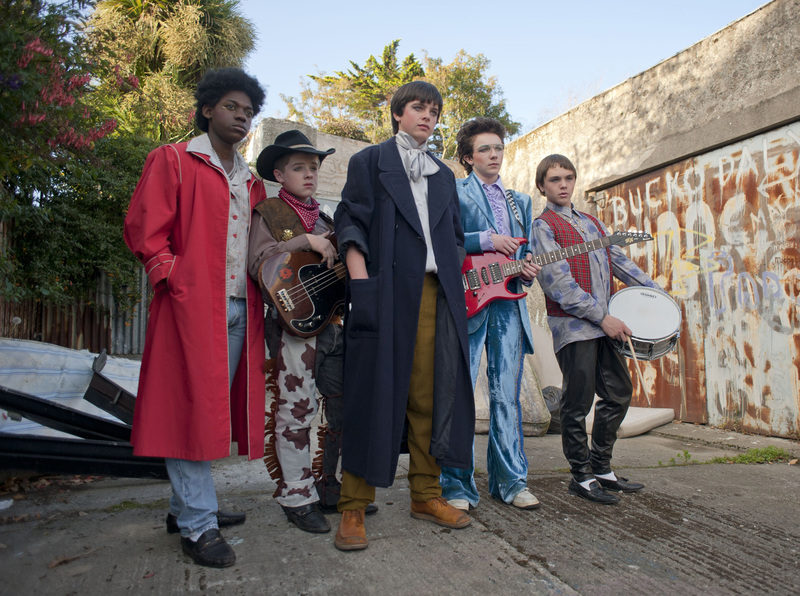 Sing Street is the third of the Irish writer-director John Carney’s low-key urban musicals, following Once (2007) and Begin Again (2013). Like Once, it’s set in Dublin (Begin Again took place all over New York), but for the first time Carney’s focus is teenage musicians rather than adult ones. The period is the mid-eighties. His hero, Conor (Ferdia Walsh-Perlo), is a fifteen-year-old whose parents (Aiden Gillen and Maria Doyle Kennedy) shift him to a Christian Brothers free state school as an economic measure when they’re beset with financial woes. The usual rocky transition to a new environment for a sensitive kid trying to find himself is exacerbated by a bully named Barry (Ian Kenny) who singles Conor out for special attention, but Conor eventually figures out how to deal with him, and as it proceeds the movie treats him with unexpected affection. (His father is a brute.) The bigger bully is the headmaster, Brother Baxter (Don Wycherley), who humiliates Conor when he wears brown shoes rather than the requisite black ones to school and protests that a new pair isn’t in her parents’ budget, and wallops him when he comes to school wearing make-up – part of his new glam-rock look. The band Conor and his friend Eamon (Mark McKenna) start – Conor plays guitar, Eamon (who’s skillful on several instruments) on bass, with three other kids (Percy Chamburuka, Conor Hamilton and Karl Rice) backing them up – winds up as partly a rebellion against Brother Baxter’s tyranny and the deadly atmosphere of Synge Street School. But Sing Street isn’t really about the power of music to stave off the workaday misery of a Dublin existence, like The Commitments. The band, which they dub Sing Street, begins as a romantic gesture. Conor is entranced by a girl named Raphina (Lucy Boynton) who has quit school with the hope of pursuing a modeling career in London and hangs out in the meantime outside a home for girls across from Synge Street – her digs since her dad is dead and her bipolar mother is in and out of psychiatric institutions. To get Raphina’s attention, Conor claims to be in a band and invites her to appear in their videos. Then he has to get an actual band together and shoot an actual video, which neither he nor Eamon knows the first thing about. The loose, seat-of-their-pants approach of the boys – including Conor’s first new friend at the school, nervy Darren (Ben Carolan), who declares himself their manager – is part of the movie’s charm. The style of the young Irish actors is so tossed-off and understated that it may take some getting used to, but once you cotton onto it you start to locate the emotional range in their performances. Carney’s direction is minimalist, but his camera catches the sparks of romantic ardor and renegade resistance in Walsh-Perlo’s Conor (or Cosmo, as Raphina nicknames him) as well as his frustration with his parents’ distracted, self-involved behavior. (Their marriage is falling apart, perhaps as a result of their money struggles; his mother has been sleeping with her boss.) He doesn’t seem to have much of a relationship with his sister Ann (Kelly Thornton), who barely functions as a character in the picture. But Brendan acts as mentor and support, when he’s not in a funk brought on by his own anger at their parents and his image of himself as a failure. The tentative coupling of Cosmo and Raphina undergirds the movie’s arc, which is, of course, his coming into himself. Boynton, a home-grown beauty with a confident sense of style, and Raynor, Corolan, McKenna and Kenny all contribute distinctive humor and personalities to the mix. The movie needs a more interesting look – Yaron Orbach, who shot it, did a better job on Begin Again – and when Sing Street uses the school gym as a setting for its third video, “Drive It Like You Stole It,” the dream version that plays in Cosmo’s head works better musically than it does visually; the song, like several of the others (“Up,” “To Find You,” “Girls,” and “Go Now,” which Adam Levine croons on the soundtrack), is splendid. Most of the time the movie’s lack of polish operates in its favor. Once is still Carney’s best movie to date, but though he sticks to one genre he isn’t repeating himself; his narratives are sufficiently different from each other to allow him to explore a variety of ideas about how to do an independent backstage musical in the twenty-first century. He must have spotted a kindred spirit when David Mackenzie released Tonight You’re Mine in 2011, but Carney occupies a small corner of the movie musical that he’s more or less invented – the handmade backstage musical.